Lightweight. Portable. Intuitive. A fusion of traditional practise with pioneering video technology. Difficult intubation occurs in around 2% of routine anaesthetic cases,1 while in the pre-hospital setting the rate is as high as 7% to 10%.1 Worldwide, up to 600 patients are estimated to die annually as a result of the complications that occur during tracheal intubation.2 Direct laryngoscopy is an effective method for securing the airway while video-assisted laryngoscopy provides an improved view of the glottis. 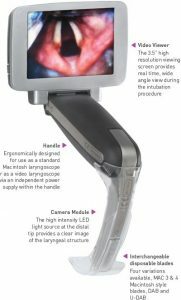 APA™ Video Laryngoscope is a multi-functional device designed to aid intubation for both routine and difficult airways. As a traditional laryngoscope – the handle offers high intensity LED illumination. 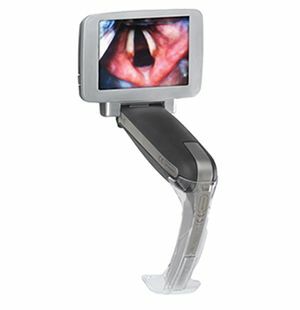 As a video laryngoscope – APA™ offers improved line-of-sight visualisation (up to and including some Mallampati grade III). As a difficult airway device – a unique prism directs the line-of-sight around the anatomy. The blade is designed to assist in lifting the epiglottis for grade III and IV cases. The built-in tracheal tube channel assists the ETT into the laryngeal opening. As a teaching tool – the video output allows connection to an external monitor or a video transfer/recording device as an effective teaching aid for novice users and trainees.